Mobile aircraft service units—like Duncan Aviation's interior SWAT, AOG parts and Engine Rapid Response Teams—offer on-site cleaning, AOG support and even major inspections. Mobile service units are in the headlines a lot these days. Most of the big aircraft service names have them and there are also a lot of smaller operations throughout the United States. 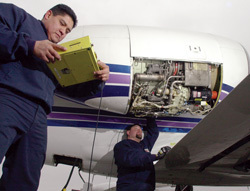 They offer everything from cleaning to AOG emergencies to engine changes and even major inspections. Sometimes a road team will be able to solve a problem faster than you can, and can reach you in a time frame that may compete with a full-service facility's onsite availability. This is true for troubleshooting and AOG parts situations. You can get the team and the parts to your location in relatively short order and be back in the air in no time. However, for larger jobs, it may take a road team longer than a full team at a service center. Two or three guys working dozens of labor hours will just take longer than five to six guys working an inspection on round-the clock shifts. Using road teams spares you the cost of moving your airplane to a full-service facility, and for someone to travel with it to watch over the maintenance. A mobile team can be a good solution for an in-house team that needs a day or two of technical or heavy help, but can handle the rest of the inspection on their own. However, road teams cost more. You are paying for their time, door-to-door service and in many cases their expenses. Convenience costs more. Dennis VanStrien is an Airframe Service Sales Rep at Duncan Aviation's Battle Creek, Mich. facility, and specializes in Citation aircraft. He began working in aviation in 1976.